In 1945, America had just emerged from World War II. A conventional fixed wing aircraft was still the most sophisticated flying machine of the time. 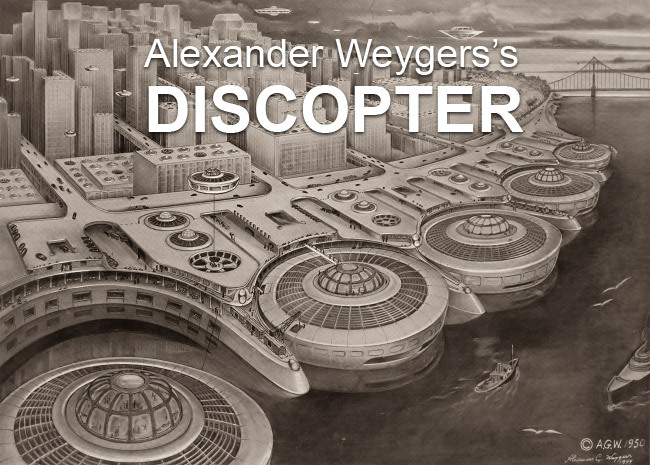 In the summer of that year, a ship engineer/sculptor named Alexander Weygers received confirmation of a patent for his 18 year old dream: "The Discopter." 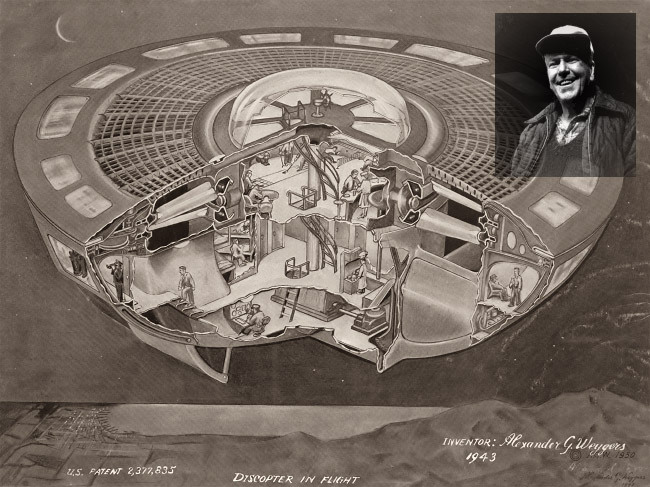 Two years before the term "flying saucer" was ever used, Weygers vision gave a glimpse into the future as compelling then as it is today. "They told me I was too far ahead of my time, but I thought an inventor always is, isn't he?... It must have been 1927 when the idea came to me. I was working as a draftsman and we had been talking about propellers. It seemed to me the helicopter was a unfinished piece of engineering. You cannot just lift it up. It must move as a pendulum, which makes it very limited in use." - Alexander Weygers The Daily Review, August 9, 1985. About the same time that he lived in Berkley, Alex invented an unusual flying craft. 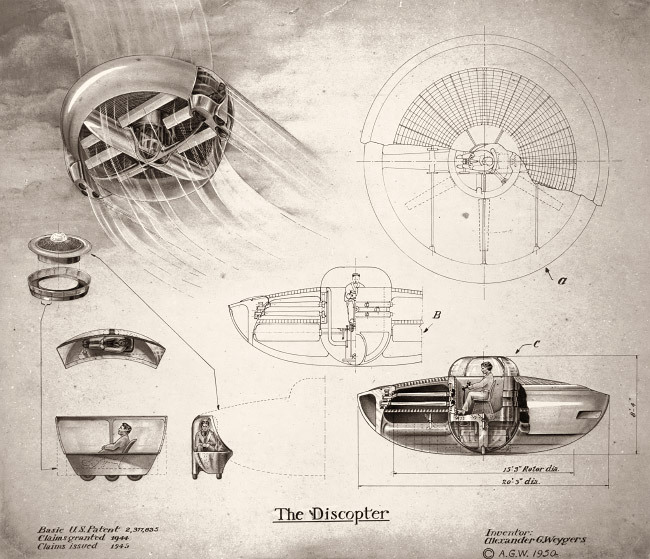 That invention was what he called the "discopter", a vertical liftoff aircraft that looked very much like what was to be later termed "flying saucer". He made numerous detailed drawings of the aircraft and other drawings of an American city with many "discopter" ports that looked very futuristic. He sent these detailed plans to all the branches of the U.S.. Military and was eventually told that they were intrigued by the concept and the design of the craft but were not prepared at that time because the war effort superseded its development. However he did indeed patent the design for the "discopter" in January 1944 with the U.S. Patent Office and it served as the prototype for other similar aircraft that have been developed up to the present day. The patent was filed January 1, 1944. The patent was granted June 5, 1945. Alexander Weygers did more than designing flying discs. He was active in an unusual large number of fields. 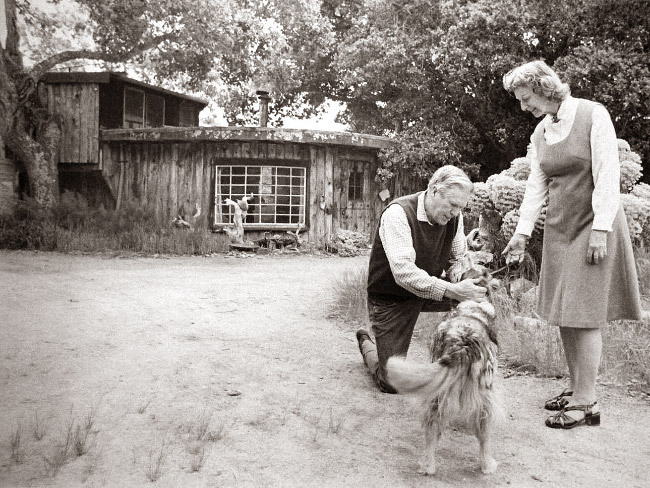 Wikipedia starts by saying he was "a polymath Dutch-American artist who is best known as a sculptor, painter, print maker, philosopher, and author." A polymath, sometimes referred to as a Renaissance Man, is a person whose expertise spans a significant number of different subject areas. In less formal terms, a polymathic person may simply be someone who is very knowledgeable.